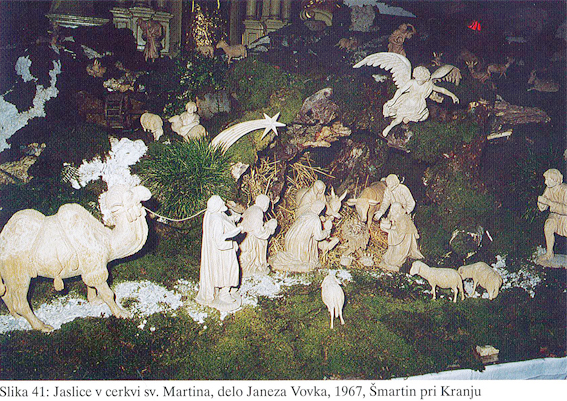 Slovenians spend Advent in preparing for Christmas and in collecting materials for making the Nativity set. In Slovenian churches and in private homes the Advent Wreath is quite new and is in the last few decades prepared with greenery and candles. 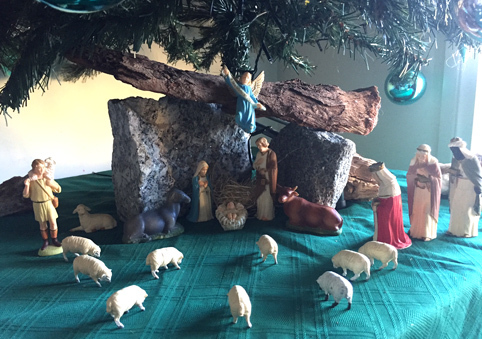 In Australia Advent is celebrated at all Slovenian churches and Advent wreath is found at most Slovenian homes. A very old custom is also known in Slovenia named MARIJO NOSIJO – carrying of a statue of Mary. The custom reminds us of the travels of the pregnant Mary and Joseph, combined with the celebration of the ‘Nine days of Christmas’. The statue of Mary spent each night with a different family, being honoured each evening with the home devotions (praying of the Rosary, litanies and singing of hymns). 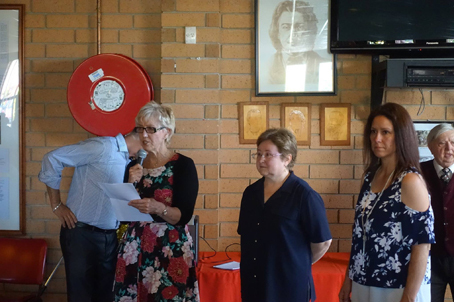 In Melbourne the custom was re-introduced by Fr Metod Ogorevc OFM in 1998 and a framed photo of Marija Pomagaj has spent a few days with the families welcoming her. The custom ceased in 2001. 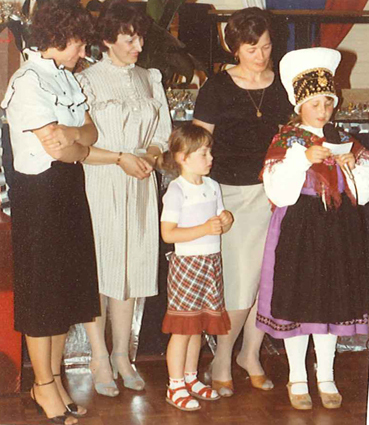 Every Slovenian home in Slovenia had a special place in the house, where the cross was put throughout the year. In the month of May the statue of Mary was put in that special place and at Christmas this was also the site for jaslice. In some parts of Slovenia the wheat is sown in a small dish and put in the special jaslice place. 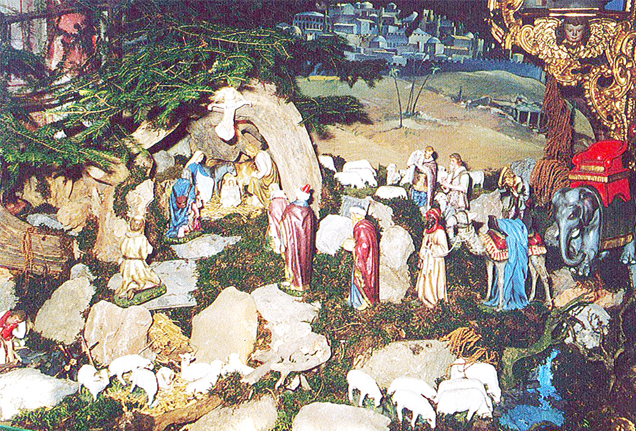 Throughout Advent the moss, bark, small pretty stones, twigs and branches of fir trees are gathered, followed by the making of the simple stable with a straw covered roof, painting of the figures of Mary, Joseph, baby Jesus, together with shepherds, oxen and donkey, sheep, shepherd’s dogs, camels and the Three Kings. The first jaslice was prepared by Jesuits in 1560 at Coimbra (Portugal). The first church in Slovenia to have jaslice was St. Jakob in Ljubljana in 1644, and the Chronicle describes the figures as being very tall – life size. In later years the figures were painted on boards or were made of paper. First life jaslice were organised by St Francis Asissi in 1223 in Greccia (Italy) in a cave above a village. In Slovenia they are well known in Postojna Cave, and the ice jaslice in Mojstrana. SREČEN BOŽIČ! – MERRY CHRISTMAS! The first written account of jaslice by A. Praprotnik in a private home comes from 1848. 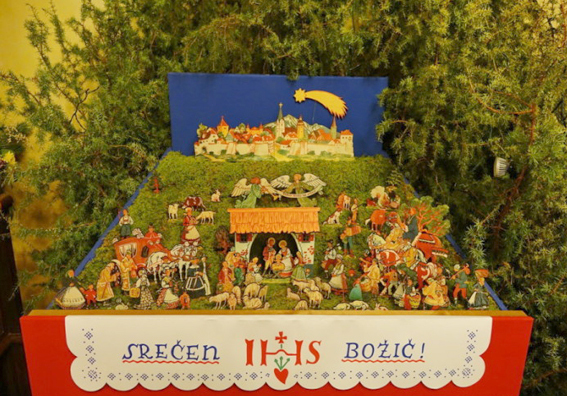 He states that Slovenians put jaslice in a triangular form in a corner of the house, with the town of Bethlehem on a little hill, and below the stable – ŠTALICA. 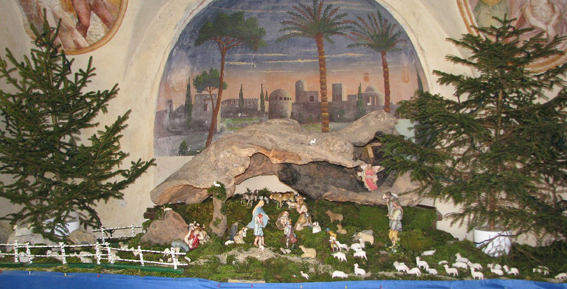 The figures of Mary, Joseph and baby Jesus are in Slovenian Nativity set placed in the stable and not in the cave as in most countries. The figures were sometimes made of wood, wax or paper, sometimes of painted pottery. The important part of Slovenian jaslice is the linen cloth (sometimes molded from wood and hand painted) – PRTIČEK. There was no home in Slovenia without jaslice and the Slovenians living in other countries still keep the tradition very much alive. Under the Christmas tree today in Slovenian homes are always jaslice, prepared on Christmas Eve. 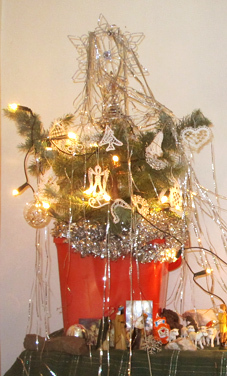 In Slovenia a small fir tree was hung in the BOHKOV KOT (God’s little corner) of every house. 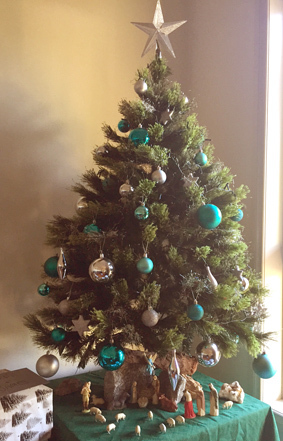 The tree was not decorated, and neither was the small fir tree that was sometimes put on a fence. The fir tree was named KRISPAN. The BOŽIČNO DREVESCE (the Christmas tree) was unknown in Slovenia until the First World War. Preparations for Christmas Eve in Slovenia continue with the cleaning of the house and the surroundings. Christmas Eve has a different name according to the region of Slovenia. Special Christmas cake (or more cakes) BOŽIČNIK are baked, named also POPRTNIK. The Christmas cake was put on a table, covered with a white cloth and the family gathered for meals at another, less prominent place. At the Morning Mass people collected blessed water to take home for the evening blessing of their homes at the time of the Three Holy Evenings (Christmas Eve, New Years Eve and before the Feast of the Epiphany). The table with Božičnik was blessed and not to be touched or used until the Feast of the Epiphany. The first Holy Evening – Christmas Eve begins at dusk. The bells begin to ring. In the homes the blessing of the house and surrounding buildings with the holy water begins, followed by incense burning. The whole family follows praying on the way. After the blessing the family sits at the table for a simple meal. 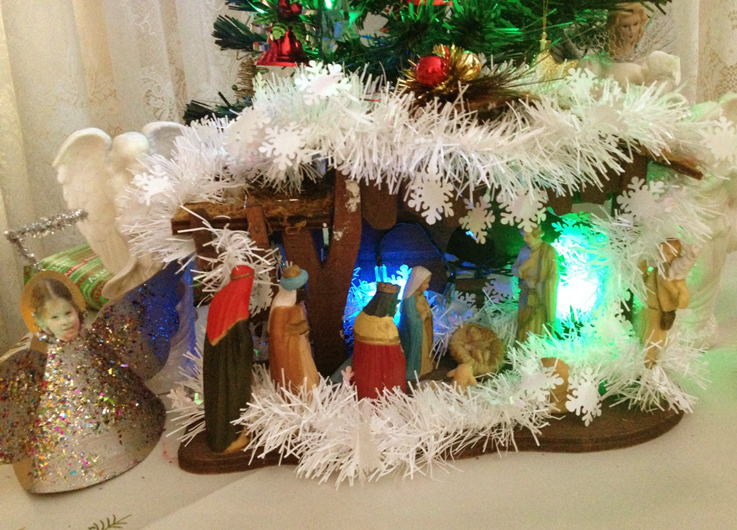 Waiting for Christ’s Birth follows with the singing of songs, Christmas carols and readings from the Bible. In Australia, some traditions are still alive and kept. The whole family usually goes to Midnight Mass except one member, who stays as a guardian of the house. The bells toll and the church is well lit in the winter night. Many Christmas songs are sung. 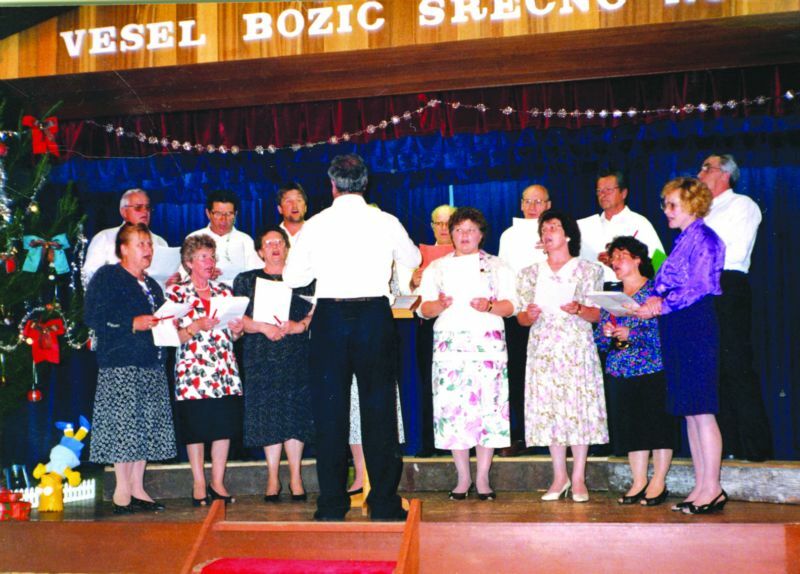 In Slovenia more than 80 Christmas songs are known, most of them unique. After the return from Mass the family has a warm meal, most of the time KOLINE – the black pudding sausages. There were no presents on Christmas Eve in Slovenia except sometimes an orange for the whole family, walnuts and hazelnuts or dried apples. In Australia the Christmas Eve is in Summer with hot days and evenings, and foods are festive. 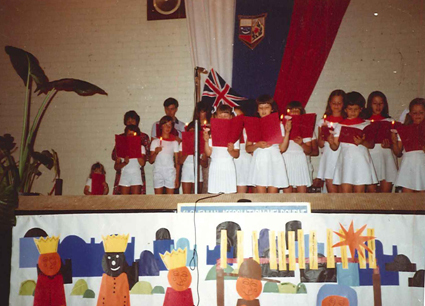 The traditional Midnight Mass is in all Slovenian churches: Melbourne, Sydney and Adelaide (in Melbourne – Kew, Midnight Mass is at 9pm, not at midnight), with Slovenian Christmas Hymns and Carols. 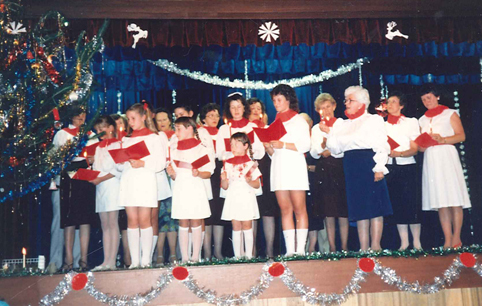 In Slovenian church in Melbourne, in years 1998 to 2011, the cultural animators Anita and Andrew Fistrič introduced Christmas Eve programs with Slovenian and English Christmas Carols sung by second and third generation Slovenians, joined by some Slovenian musicians, church choir; presenting-acting out a Christmas story, Christmas messages, narratives (Anita and Draga) and live Nativity set, including live sheep – cultural programs assisted by Draga Gelt. Since 2012 cultural animator Julie Bogovič Kure organises school children as shephards and angels for the Midnight Mass. 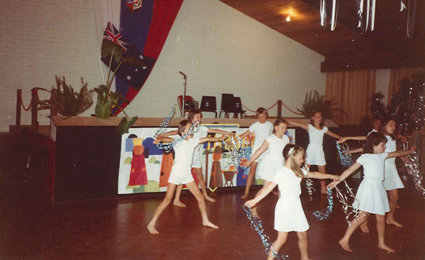 In Adelaide, the Slovenian community participated in the Adelaide Christmas Pageant for many years. 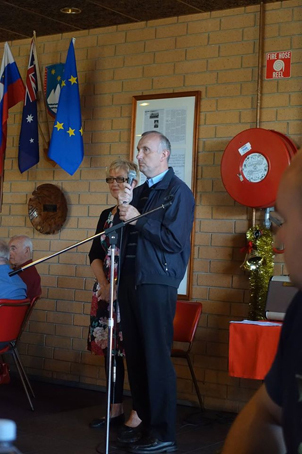 It is with great pleasure and pride I announce the following of the Adelaide Christmas Pageant. 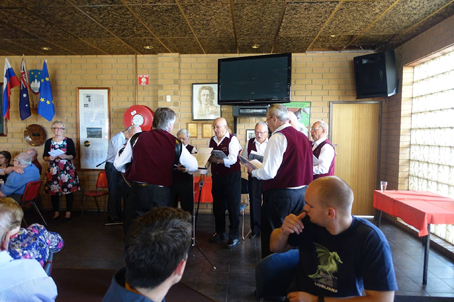 “In keeping with the Christmas spirit, I had the good fortune to write a song for Adelaide’s famous Christmas Pageant that was used as the Pageant’s theme song a few years ago. This video is also the most viewed video of the Adelaide Pageant on YouTube. 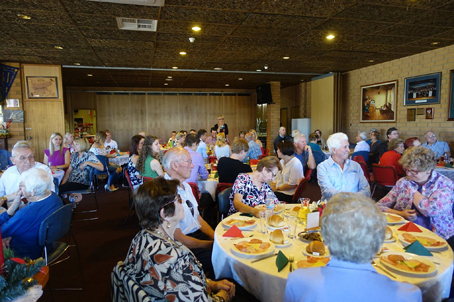 In Melbourne Slovenian church, the jaslice are set for many years by Simon Grilj and some assistants; in Adelaide Slovenian church from 1980 to 2014 by Fr Janez Tretjak OFM, exquisite jaslice with many plants, lights and ornaments; now by Fr David Šrumpf OFM and assitants; in Sydney Slovenian church by Fr Valerijan OFM OAM and helpers, recent years by Fr Darko Žnidaršič OFM and assistants. Slovenians everywhere like to prepare the jaslice and Christmas trees. 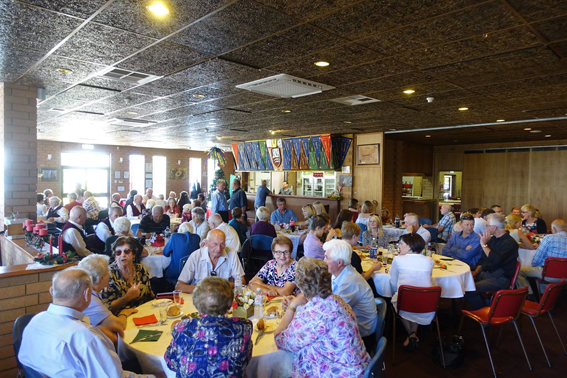 At the Slovenian Association Melbourne, Helena Leber introduced the BOŽIČNICA – Christmas get-together for the Seniors in 1972 and was organised every year until 1992. 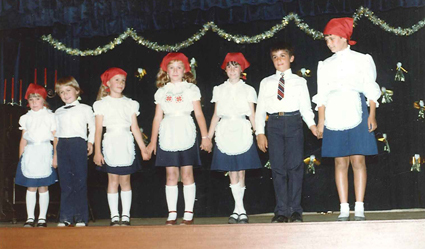 Children and teachers of Slovenian School of Slovenian Association Melbourne (Draga, Magda and Marija), and some adults, participated in the Christmas cultural programs performing with short Christmas plays, pantomimes, Slovenian and English Christmas Carols, and poetry. The stage, and the hall, were beautifully decorated by the teachers, Anica Smrdel (Jaslice) and Tone Tomšič, who proudly cut and prepare a huge Christmas tree. For the finale, all children and participants sang Silent Night in Slovenian and English languages with lit candles in their hands and all the seniors were happy to join in. 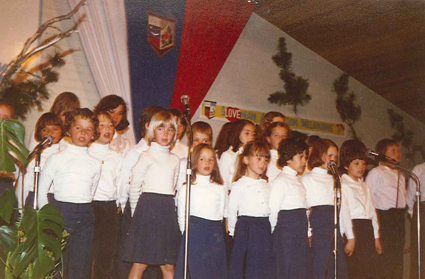 Some Slovenian Christmas songs – Carols date back to the 15th century, with the ENO DETE JE ROJENO – The One Baby is Born (to listen click on title of the song) being the oldest known Slovenian Christmas Carol. The Christmas Day in Slovenia is the holiest day of the year and people do not work around their homes. In some regions of Slovenia, visitors on Christmas Day mean a bad omen. 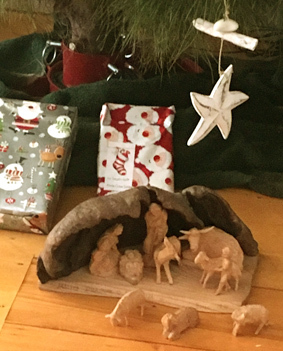 The Christmas Day is for the family; wishing each other Merry Christmas was at Mass time and then people went to their homes, to celebrate the Birth of Jesus in their hearts and welcome Him into their families. People never went visiting on Christmas Day, not even neighbours. They only went to church and then home again. There was a celebration meal at noon. The next day people went visiting to see and admire each other’s jaslice. 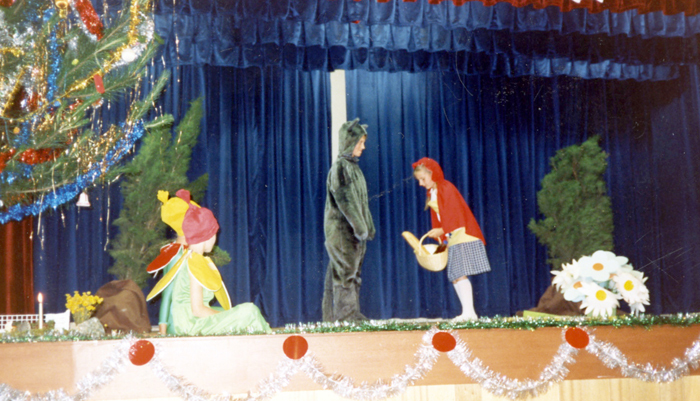 Under the Communists Christmas day in Slovenia was an official working and a normal school day. Only since the Independence of Slovenia, 1991, is Christmas day a public holiday. 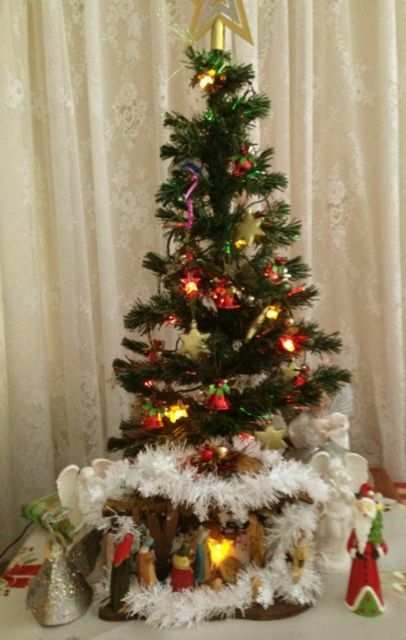 Most Australian Slovenian families celebrate Christmas attending the Mass in the morning and celebrating with the family, including festive traditional foods and gifts from Father Christmas. On New Years Eve the blessings of the houses and surroundings were repeated as per Christmas Eve. After New Year the KOLEDNIKI – the messengers of well wishes were walking from home to home, singing traditional songs. These songs date to the Middle ages and are unique to each Slovenian region (to listen click on title of the song). The old traditions of blessings and wellwishers walking from home to home is mainly in Slovenia. 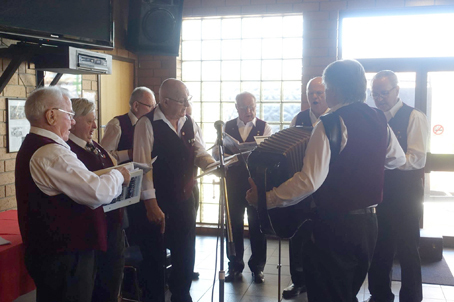 In Australia, all Slovenian Associations organised, some until recently, New Year’s Eve dances with dancing and celebrations to early morning hours and best wishes for the New Year. The Eve before the Feast of the Epiphany the blessings of the houses and surroundings were repeated for the third time. On the door-posts the new date was written with chalk and the initials of the Three Kings. (Example for next Christmas: 20 G + M + B 00). The Three kings: Caspar, Melchior, Balthazar were added to the jaslice, symbolizing their arrival at the stable to see and honour baby Jesus (to listen click on title of the song). 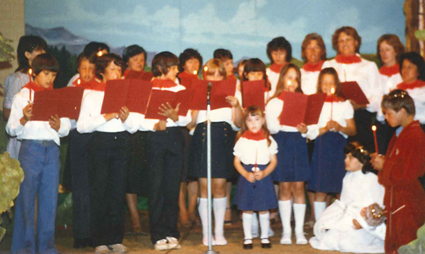 The Christmas Season in Slovenia ends on 2nd February, on the day of the Presentation of the Lord (SVEČNICA), and until that time Christmas songs and Carols are sung, and the jaslice stay set in the corner until that Feast. 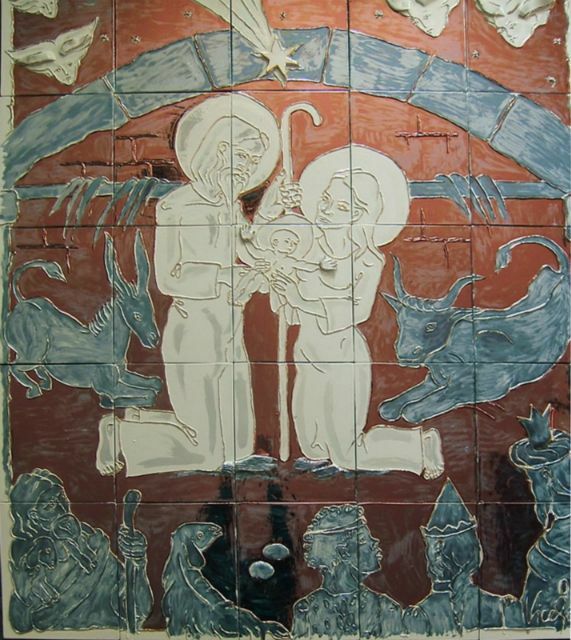 In Australia, the Epiphany is celebrated in Slovenian churches and jaslice stay displayed until the Presentation of the Lord in February. 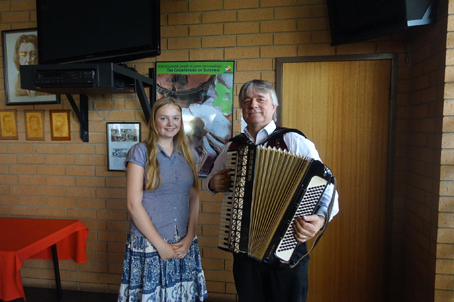 The Slovenian Radio programs in Australia always present special sessions for all the festive times.